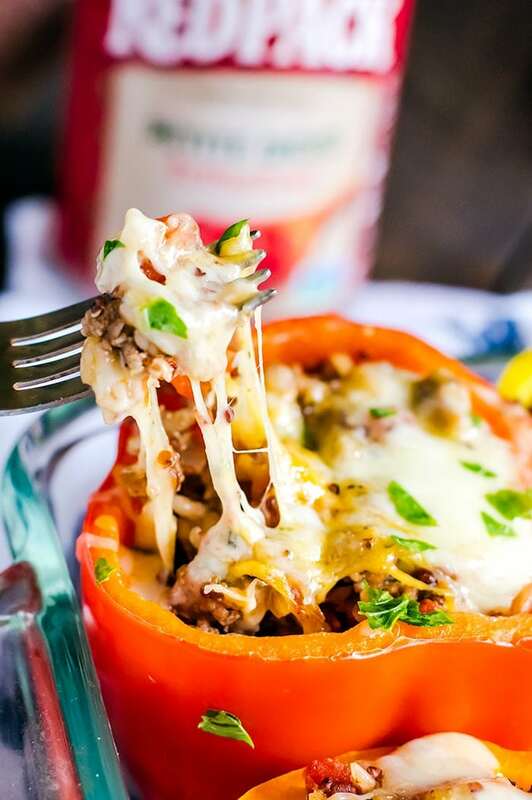 An ultra cheesy turkey stuffed peppers recipe that is ready and on the table in 30 minutes! This easy dinner recipe is a quick and delicious way to satisfy everyone at the dinner table tonight. 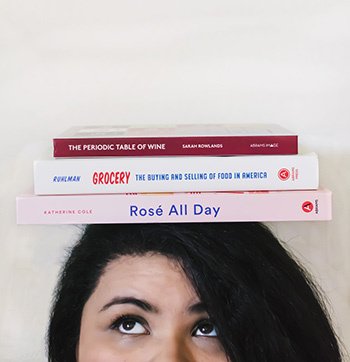 When I first started my blog almost two years ago (I can’t believe it’s been that long already! 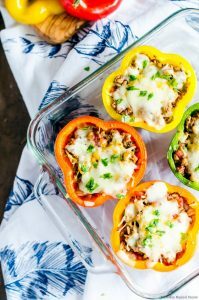 ), one of the first recipes I made for the blog, but never made it to the site, was this cheesy turkey stuffed peppers recipe. It is one of my favorite go-to weeknight meals to make for my family and I couldn’t wait to share it with you. Of course, the recipe never made it to the blog because, well, the photos were awful. I almost don’t want to tell you this, but I took the photos on a $1 plastic plate…. outside on an old glass patio table…. at about 6pm on a cloudy day. 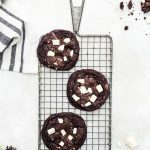 But I’m glad that I decided to wait to remake the recipe for you because I’ve made changes to the recipe and now it’s even better than before! (and it looks a lot better than those first photos!). It just goes to show you that the best things in life truly are worth waiting for after all. That’s a bit of extra comfort I love so much about this recipe. First, I added diced tomatoes which add more depth to the flavor and creates a nice sauce for the meat. 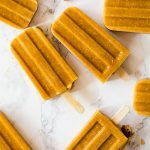 It really rounds everything out and keeps the filling from being dry which means you can eat the filling on its own if you want. I added a mix of grains. Namely, farro, wild rice, and quinoa. You can make up your own blend, or use just rice or quinoa. I’ve done it both ways and it is still just as delicious! For the cheese, I used sharp cheddar, a touch of Parmesan, and just a bit of Monterey jack cheese for extra stringiness. It is simply seasoned and the whole thing is finished in 30 minutes which means more time sitting down with your family! And let’s be honest, that’s a whole lot better than slaving over a hot stove all night, ammiright? The trick is to precook the peppers while you are making everything. Cut the tops and clean the insides of the peppers, then immediately throw them in the oven then turn it on so it can start to cook while the oven is still preheating. That way the peppers are softened and keep the filling hot when you start stuffing. That means it’s out of the oven and in your bellies fast. Once the oven is preheated, I let the peppers bake while I am working on the filling. It cuts down on your final cooking time and leaves you with a pepper that is cooked, but still has a little bit of bite to it. 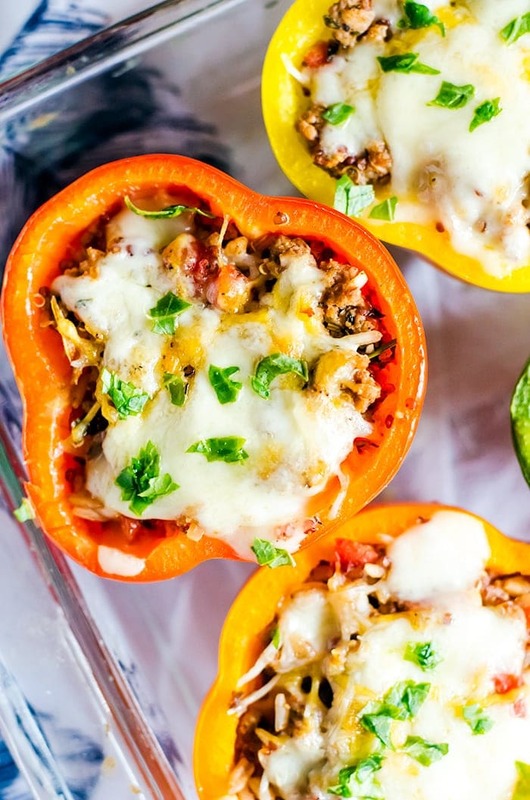 My whole family is in love with these cheesy turkey stuffed peppers. Whenever they find out it is on the menu for that night, everyone somehow makes sure they are home for dinner. Even my daughter, who’s become quite the picky eater will gobble up the filling inside and ask for more! Of course she won’t touch the peppers, but she can eat two huge bowls of the filling on its own! 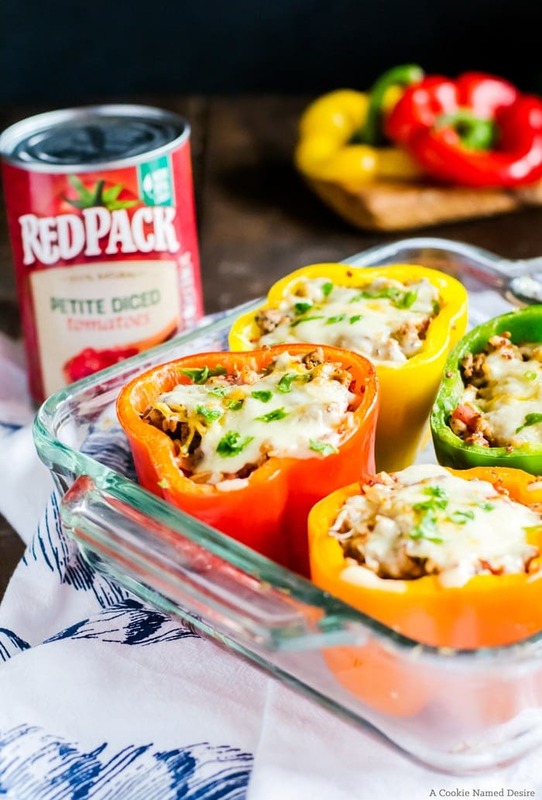 Ultra cheesy turkey stuffed peppers the whole family will love! Preheat the oven to 350 degrees F. Cut off the tops of the bell peppers and clean out the insides. Place in a baking dish, cut side up. Place the peppers in the oven while it is preheating. Once the oven is finished preheating (it's reached 350 degrees F), keep the peppers in the oven until you are ready to stuff. While the peppers are roasting, cook the grains (I used a mix of wild rice, quinoa, and farro) and cook in the chicken broth until cooked through. Heat the extra virgin olive oil in a large skillet and add the onion and garlic. Cook until fragrant. Add in the ground turkey and cook until all the pink is gone. Add in the diced tomatoes and it's juice, salt and pepper, crushed red peppers, oregano, basil, and gains then heat through. Fold in 2/3 of the cheese into the turkey mixture. Carefully remove the peppers and stuff with the filling then top with the remaining cheese. Bake for another 10 - 15 minutes. Do you add the quinoa to the turkey mixture ax well or serve it on the side? PS – The recipe says to cook the grains but doesn’t mention them again after that. I ended up mixing everything together and it tasted great, but it might be less confusing if you edited the recipe to mention what needs to be done.. I had to read it a couple of times to make sure I wasn’t missing anything.